When leaving keys with parking lot and valet attendants, the following procedures will ensure that your vehicle’s trunk and glove box compartment can only be opened with the master key. When leaving the key with a parking lot attendant or valet, perform the following and leave the sub key with the attendant. The sub key can start the engine and operate door locks only. 1. Open the trunk lid with the master key. 2. 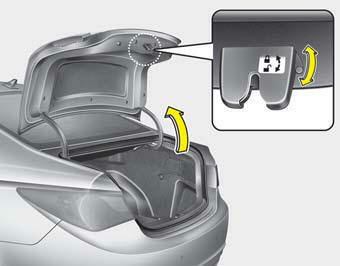 Set the trunk lid control switch to UNLOCK position ( ). In this position the trunk will open with the trunk lid release button or transmitter. The trunk can never be opened with the sub key.